With companion recorded accompaniments online. Composed by Various. Vocal Collection. Movies, Children, Disney. Softcover Audio Online. 136 pages. 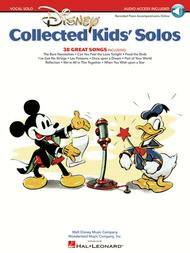 Published by Hal Leonard (HL.230066). 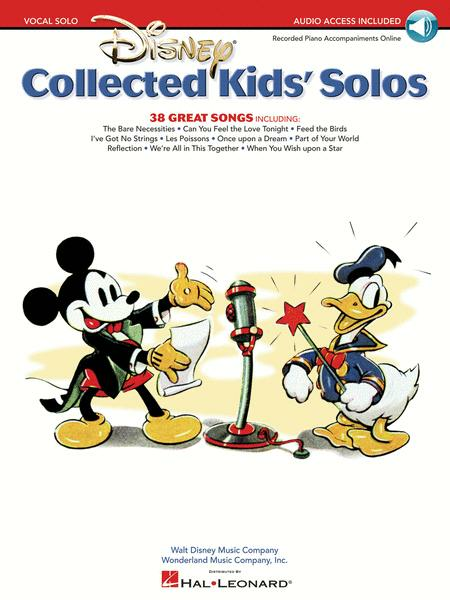 38 great Disney songs for kids with companion recordings of piano accompaniments for practice available online for download or streaming. Contents: Baby Mine (DUMBO) • The Bare Necessities (THE JUNGLE BOOK) • Beauty and the Beast (BEAUTY AND THE BEAST) • Bibbidi-Bobbidi-Boo (The Magic Song) (CINDERELLA) • Can You Feel the Love Tonight (THE LION KING) • Candle on the Water (PETE'S DRAGON) • Chim Chim Cher-ee (MARY POPPINS) • Cruella De Vil (101 DALMATIANS) • A Dream Is a Wish Your Heart Makes (CINDERELLA) • Ev'rybody Wants to Be a Cat (THE ARISTOCATS) • Feed the Birds (MARY POPPINS) • God Help the Outcasts (THE HUNCHBACK OF NOTRE DAME) • I'm Late (ALICE IN WONDERLAND) • I've Got No Strings (PINOCCHIO) • It's a Small World (DISNEYLAND/WALT DISNEY WORLD) • Lavender Blue(Dilly Dilly) (SO DEAR TO MY HEART) • Les Poissons (THE LITTLE MERMAID) • Let's Go Fly a Kite (MARY POPPINS) • The Lord Is Good to Me (MELODY TIME/JOHNNY APPLESEED) • Love Is a Song (BAMBI) • Never Smile at a Crocodile (PETER PAN) • Once upon a Dream (SLEEPING BEAUTY) • Part of Your World (THE LITTLE MERMAID) • The Perfect Nanny (MARY POPPINS) • Reflection (MULAN) • The Second Star to the Right (PETER PAN) • So This Is Love (The Cinderella Waltz) (CINDERELLA) • Some Day My Prince Will Come (SNOW WHITE AND THE SEVEN DWARFS) • The Unbirthday Song (ALICE IN WONDERLAND) • We're All in This Together (HIGH SCHOOL MUSICAL) • When I See an Elephant Fly (DUMBO) • When You Wish upon a Star (PINOCCHIO) • A Whole New World (ALADDIN) • Winnie the Pooh (THE MANY ADVENTURES OF WINNIE THE POOH) • With a Smile and a Song (SNOW WHITE AND THE SEVEN DWARFS) • The Work Song (CINDERELLA) • You've Got a Friend in Me (TOY STORY) • Zip-A-Dee-Doo-Dah (SONG OF THE SOUTH).